A new book written by Dr. Gary Dolowich, M.D. The Chinese model of the Five Elements has been used by acupuncturists for thousands of years to balance ch'i, the vital force of the body. This book explains how you can work with this ancient map of energy and apply it to diagnose physical illness, resolve emotional imbalances, and navigate the stages of life. Archetypal Acupuncture: Healing with the Five Elements draws upon case histories, spiritual poetry, classic sources such as the I Ching, and examples from contemporary culture to revitalize traditional wisdom, bringing East and West together. 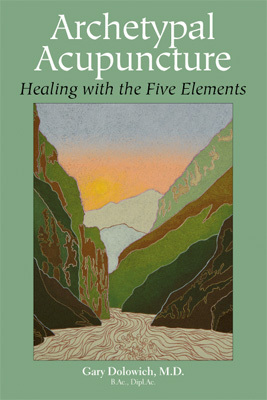 Gary Dolowich has taught the Five Element system at various acupuncture colleges for over 30 years, and this book has evolved directly from that experience. You are invited on a journey in which the elements are understood as archetypal symbols that allow us to cultivate a life in harmony with the rhythms of nature. The second edition of Archetypal Acupuncture has now been published by North Atlantic Books and is available through Random House. "Dr Gary Dolowich has written an intensely moving and balanced account of his synthesis of Five Element acupuncture, Jungian psychology, and modern medicine. There is much to consider and ponder in this engaging volume." "This book serves as a path for our Western world into the heart of Chinese medicine. I recommend Archetypal Acupuncture to practitioners and patients, as well as to those who simply seek a fresh appreciation of the mystery that is life." "Dr. Dolowich captures the spirt of the Five Element system, as transmitted by J.R. Worsley, and expands our understanding in an exciting direction."